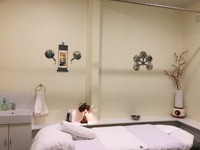 Massage is systemized manipulation, usually by hand, of the body to relax the muscles, improve circulation, relieve tension, and help eliminate body wastes. Relaxation of the mind and body follows. Massage is mentioned in ancient Chinese medical literature around 2600 BC. The ancient Greeks and Romans also believed in the benefits of massage. Heinrik Ling developed modem western massage in the early 10th century. His system is known as "the Ling system" or "the Swedish Movement Treatment". The goal of massage is to help the body to heal itself with a corresponding increase in well being and health.